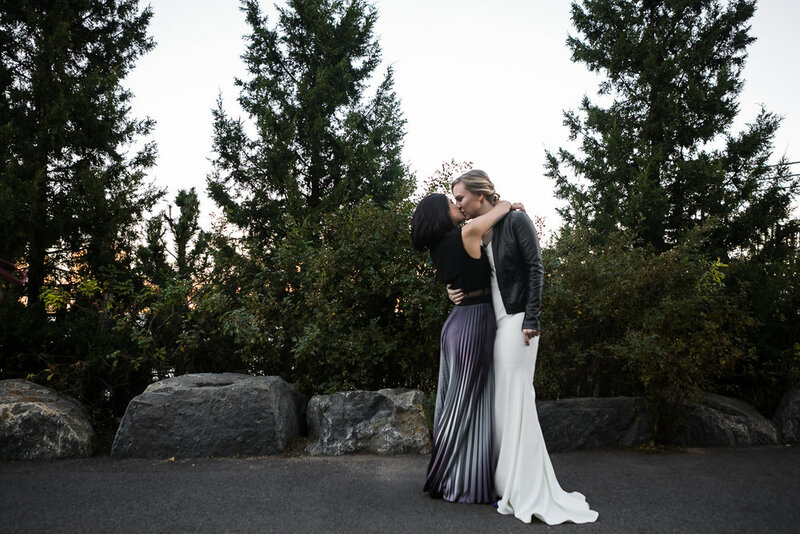 Kristin (blonde) and Marisa are both architects, and their passion for design was reflected in every aspect of their wedding day. 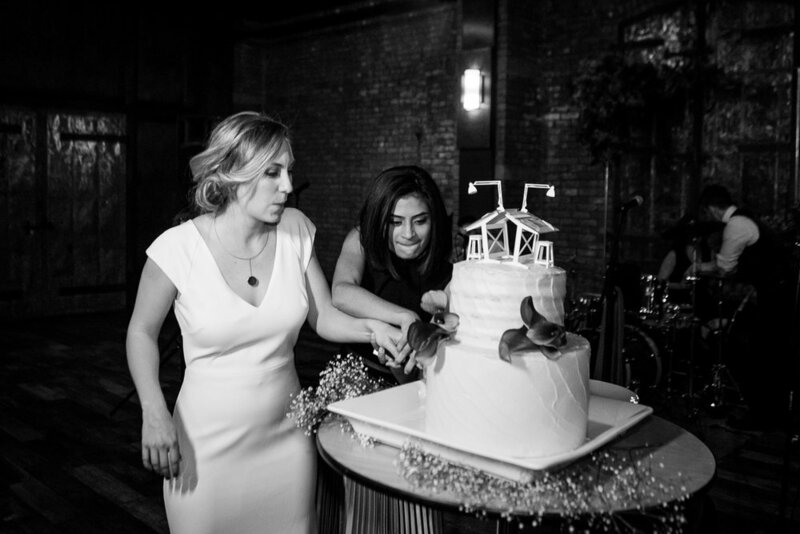 From their choice of reception venue at 26 Bridge (a former metal factory turned event space) to their personally designed invitations, rings, and logo, they created a wedding that captured exactly the aesthetic they were going for: modern, minimalistic, and monochrome. While their wedding day was meticulously planned, their engagement was not. One night, while returning home after dinner, they stopped to listen to a man singing “Unchained Melody” in the subway. So moved by his incredible rendition they decided not to go home and instead went to the Brooklyn waterfront, got a bottle of champagne, and sat in front of the carousel watching a lightning storm light up the Manhattan skyline. That night, Marisa looked at Kristin and said “Marry me," then spent the next 20 minutes convincing her that she wasn’t kidding. That was just one of the very personal touches woven into the day. Kristin and Marisa were married by two dear friends who served as officiants. They chose other songs and readings that played important roles in their relationship. They invited friends and family to speak during the ceremony. And, since they and their families love to dance, a wedding band was a must. "Obviously 'marriage equality' is an important factor, but also 'equality in marriage' is important and that one of us doesn’t feel more important. None of that 'I belong to you' nonsense. We are a partnership and I think our day reflects that." Also, Toth Event Staffing was there handling the catering and event management. Cameron Toth and I had, the week before this wedding, spoken on a panel about sexual harassment and racial disparity in the wedding industry, so it was so cool to see him there. Cheers to feminist, equality-minded vendors for your wedding day. Everyone from his staff was fantastic, too.